10000000 is a Bejewelled-style dungeon-crawler hybrid that has been a runaway success, with its retro style graphics and music. 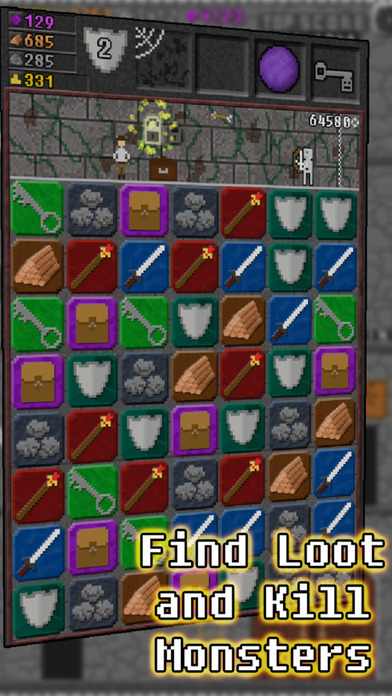 You match-three tiles in a fast-paced game, to hit monsters with swords and staves, unlock chests, use shields, and gather wood and stone to rebuild your castle. As the monsters attack you, they push you off the screen, and then you have to start a new run from the beginning. Rebuilding each room allows better weapon or armour upgrades, and so forth. The game play is pretty challenging: I had the most success essentially ignoring what I needed to be matching, and instead just focusing on matching at the bottom of the screen to generate the maximum cascades of chain matches higher up. 10,000,000 is rich in RPG features for a hybrid game. The Objectives feel a bit like side quests, or even game quests, since they give you a nice chunk of gold and some accelerate your progress/rank in the game, which unlocks more potions or allows higher room upgrades. There are more than 60 objectives to complete, with over 20 different monsters. The potions that you can activate and deactivate are a particularly cool feature, since they all come with advantages and disadvantages. For example, one might give you a higher amount of gold, but cut your wood and stone gathering to zero. Others might increase your game score, but also make monsters tougher. You can switch them on and off as you need, and the more powerful you get the more potions you unlock. It does seem to be possible to finish the game without beating it: you reach the highest level at less than 10,000,000 score, and your score doesn’t go any higher. So you might want to activate some of the higher-score-earning potions as often as possible.